Worcestershire will be without overseas players Martin Guptill and Ravichandran Ashwin for the remainder of the season because of injuries. New Zealand batsman Guptill was set to return from the Caribbean Premier League for Saturday's T20 Blast Finals. India spinner Ashwin was also due to feature in the Pears' final two County Championship Division One matches. Guptill has picked up a hamstring injury while Ashwin has a groin problem from the Test series against England. Worcestershire are at T20 Blast Finals Day for the first time and will face Lancashire in the opening semi-final at Edgbaston. 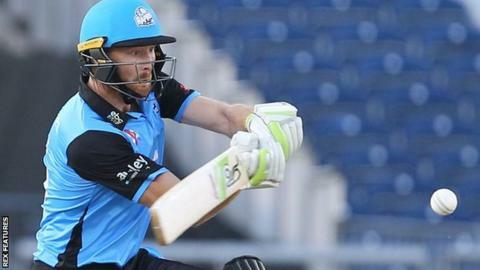 Guptill played in seven Blast games for the Rapids earlier this summer and struck a 35-ball century against Northamptonshire Steelbacks, the second fastest in T20 domestic cricket in England. Ashwin featured in the closing stages of the Pears' promotion from County Championship Division Two last season, but will be unable to help them in their fight against relegation this month. "We're exploring our options for an overseas replacement for the final two Championship matches," chief executive Matt Rawnsley said. "The news is not good regarding Martin Guptill either. We had been in touch about whether there was a chance of him coming back for Finals Day." The Pears have a third injury worry with skipper Brett D'Oliveira missing their current County Championship Division One home game against leaders Surrey with a back spasm. Worcestershire head of sports science and medicine Ben Davies said: "Brett is working hard to ensure he is fit for Finals Day in the Vitality Blast."